Excellently located on Kolodvorska Street in an older building only 700 m from the main square in the historical centre on one side and the main bus and train station the other side, this apartment is an excellent base when exploring Ljubljana and its surroundings. Apartment is on the 1st floor with no elevator access. 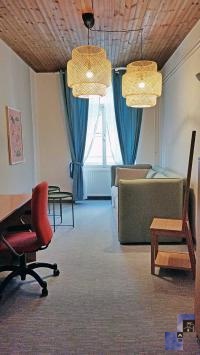 Air-conditioned apartment has a bedroom with two twin beds, living room with sofa and armchair, which fall down to beds (160 x 200 cm) and (100 x 200 cm) and writing desk. Kitchen is equipped with stove, oven, microwave, spacious refrigerator and a dining corner with the entrance to the lodge. Bathroom has a shower, toilette is separated. It is equipped with all the needed cooking utensils, cutlery, toaster, iron with ironing board, hair dryer, CATV, telephone, free broadband wired and wireless (Wi-Fi) internet access, washing machine and drying machine. Towels and linen are provided. It has a parking space in the inner yard of the building (only for personal vehicles that do not exceed the usual size of 5m) - daily price is 12 €, monthly price is 120 €. Reservations must be made in advance. At monthly price, payment for the final cleaning at departure is obligatory (70 €). 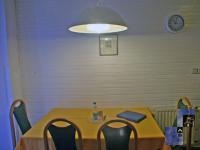 Self service breakfast against additional payment in City hotel, Dalmatinova street 15 (250 m). We were really pleased staying in your apartment. Every thing was perfect: friendly staff, clean, nice atmosphere. We love Ljubjana and will certainly come back again. I already recommend several friends to visit. Thanks again for a wonderful time. Had a wonderful time in Slovenia, great place & friendly people.! The apartment is well equiped in a great location. We will definitely come back & recommend this beautiful city to others. Već drugi put sa svojim prijateljima iz Švedske dolazimo u vaše apartmane. Sve super! Had a great time in Ljubljana-great city. Kaja apartment is ideal location. Recommend day trips to Bled on train. What a magical place!And so much to do and see. Thank you for the friendly welcome and uncomplicated stay.